• Physical exercise(link is external). Getting quality and consistent exercise is associated with better brain health. • Leisure activities and social engagement.“It doesn’t matter what kind of activities, it just needs to be more activities. The more the better. It can be brain-stimulating activity or just getting together with friends,” Stern says. Some of the suspected contributors to cognitive reserve are now part of the recipe used by academic brain performance clinics to build more of it. One of the main ingredients is exercise. “Exercise stimulates the production of brain-derived neurotrophic factor, which helps new connections grow. If you have more connections in the brain circuits, then if some are lost or damaged by disease, you have additional connections that can still do the work for the brain without losing function,” says Ian Robertson, a research professor at the Center for BrainHealth at the University of Texas-Dallas. • Stress reduction. Robertson says chronic exposure to stress hormones can cut brain connections and cause the memory part of the brain (the hippocampus) to shrink. Reducing stress helps your memory improve. Tried and true stress relievers include exercise, meditation and yoga. • A healthy diet. Strong evidence suggests a Mediterranean-style diet promotes brain health. The diet is rich in fruits, vegetables, legumes, seeds, nuts, olive oil and whole grains, plus moderate amounts of fish, poultry and wine and low amounts of red meat and meat products. • Having a sense of purpose. Find something that motivates you to get out of bed in the morning, such as a hobby or volunteering. “We don’t know why yet, but it may be that a sense of purpose makes you inclined to stay active, and if we do something for someone else we get a release of oxytocin and dopamine, which is like a natural antidepressant,” Robertson says. • Learning new things. “Learning something new, like how to play a new instrument or speak a second language, is incredibly powerful for the brain and helps form new brain connections,” Robertson notes. • Maintaining a positive attitude. “If you have negative expectations about aging, your cognitive function declines slightly and it may indirectly diminish cognitive reserve,” Robertson says. Scientists from Columbia University, The Ohio State University, and the University of Cambridge teamed up to study why neurodegenerative diseases affect some neurons but not others. To probe the reasons behind the selectivity, researchers used new techniques that allowed them to look at individual cells in the brain to examine. The researchers found neurons that have accumulated tau proteins have a fewer presence of the components of a cellular cleaning system. The team confirmed their findings by manipulating a protein called BAG3, a component of a cellular cleaning system, in the brains of lab mice. When the level of BAG3 was lowered, tau proteins started to build up. However, when the researchers increased the level of BAG3, the neurons were able to sweep away the toxic proteins. "If we can develop therapies to support these natural defense mechanisms and stop tau from accumulating," stated Karen Duff, a neuroscientist at Columbia University Vagelos College of Physicians and Surgeons, "we might be able to prevent, or at least slow, the development of Alzheimer's and other tau-related neurodegenerative diseases." The researchers share that they still have unpublished data that explains the link between aging and a person's increased risk of Alzheimer's Disease. Alzheimer's continue to be the most common cause of dementia. According to the U.S. National Institute of Health, recent estimates suggest that neurodegenerative disease is the third leading cause of death in older people, just behind heart disease and cancer. In the United States, an estimated 5.7 million people are living with Alzheimer's in 2018. By 2050, the number is expected to rise to 14 million. There currently is no cure for Alzheimer's Disease. However, treatments are available for those who experience symptoms to improve their quality of life. This fall, tens of thousands of American football players, from grade-schoolers on up to the pros, will be treated for concussions. Experts suspect that for every player who is pulled from a game and diagnosed, another will have his or her injury go unnoticed, since only those who report feeling ill or display the most conspicuous signs of traumatic brain injury - such as losing consciousness or acting disoriented - are likely to be examined by a neurologist. In order to detect concussions as they occur, and to help coaches determine quickly and conclusively when players should be taken off the field, a team of Columbia researchers is developing what would be the first wearable diagnostic device for traumatic brain injury. Called the NoMo, the device incorporates electroencephalography (EEG) sensors of the type commonly used in hospitals to measure a patient's brain activity. The sensors, which would ordinarily be taped to the scalp, are instead tucked in between the pads of a football helmet. Upon detecting the distinct electromagnetic wave patterns of a traumatic brain injury, they will send an alert to a computer on the sidelines. "Within seconds of a player being hit, everyone will know whether or not he's suffered a concussion," says James Noble '08PH, a Columbia neurologist who designed the technology with Columbia biomedical engineer Barclay Morrison. "This will eliminate a lot of the problems you have now with coaches, athletic trainers, and team physicians having to make fairly subjective judgments about who should be removed from a game to receive a full neurological evaluation." The idea for the NoMo was inspired by Noble's experiences serving as a neurological consultant to collegiate and professional football teams. In that role, he helps the teams' doctors determine if and when players who have been benched for concussions are fully recovered and battle-ready again. This is a critical decision, since a player who returns to the field and takes additional hits too soon after suffering a concussion is more likely to incur long-term neurological damage. "Everybody involved in football wants a more reliable way of identifying when these injuries happen," Noble says. "The culture of the game, at any level, is such that the players are often reluctant to volunteer that they’re hurt. Plus, the symptoms of a concussion can be subtle and hard to spot." "One problem with accelerometers is that a concussion may result from an accumulation of hits rather than from one big one," says Noble. "Our device is more reliable because it monitors the brain’s actual physiological activity in response to these hits. It will provide a real medical diagnosis." Noble and Morrison conducted a preliminary test of the NoMo at a Columbia football practice last year. They found that it successfully recorded the players' brain waves, but that it must be made smaller to fit comfortably into a helmet. They are currently working on a new version of the device. Initially, scientists thought Alzheimer's was a simple, straightforward problem to solve. "We hoped that there would be one big mutation [that caused the disease] and everything would be fixed," says Richard Mayeux, MD, the Gertrude H. Sergievsky Professor of Neurology, Psychiatry, and Epidemiology and chair of neurology at Columbia University Vagelos College of Physicians and Surgeons. Years of disappointing clinical trials have seen one drug after another fail to slow the disease. "I think we've tried a lot of the obvious stuff and now we have to draw from many disparate fields to create a solution totally different from what we’ve tried before," says Anthony Fitzpatrick, PhD, assistant professor of biochemistry & molecular biophysics and principal investigator at Columbia University’s Zuckerman Institute. Columbia scientists are now becoming cautiously optimistic that a solution is within reach. "The analogy used is the baseball playing field," says Scott Small, MD, the Boris and Rose Katz Professor of Neurology and director of Columbia’s Alzheimer's Disease Research Center. "For a number of years, we were either in the wrong playing field or the lights were off." This article was adapted from How Columbia University is Untangling Alzheimer's, first published on the Zuckerman Institute website. Researchers at VP&S are rewriting the course of scientific investigation, intent on speeding up the process of discovery that will help patients with cancer, Alzheimer’s disease, diabetes, and other intractable diagnoses. In cancer, Andrea Califano, PhD, the Clyde and Helen Wu Professor of Chemical Systems Biology and chair of the Department of Systems Biology, decided to turn cancer treatment theory on its head. The first wave of research in pursuit of personalized oncology focused on clues embedded within individual tumors. Decode the nucleic acids gone awry within the DNA of a particular patient’s cancer, or so the thinking goes, to identify treatments tailored to target that specific mutation. It's a fine theory, says Dr. Califano, but investigators still have a lot of work to do before the vast majority of cancers yield to that approach. "Only maybe 25 percent of patients have a mutation that could be defined as actionable," he says. For more than a decade, Dr. Califano has championed what might be considered an end run around cancer mutations, focusing instead on identifying and blocking the networks of normal proteins—known as master regulators—hijacked by deranged DNA to spur tumor formation and sustain tumor growth. Prevent the signals those proteins send on behalf of a cancerous mutation, and the cancer itself screeches to a halt. In February, the New York State Health Department approved for clinical use two tests based on Dr. Califano’s work. Marketed under the names DarwinOncoTarget and DarwinOncoTreat—and developed by DarwinHealth, a Manhattan-based biotech firm co-founded by Dr. Califano in 2015—the tests are available to oncologists and researchers through the Laboratory of Personalized Genomic Medicine in the Department of Pathology & Cell Biology. DarwinOncoTarget identifies all proteins in an individual's tumor that are acting abnormally and for which an FDA-approved or investigational drug already exists. DarwinOncoTreat homes in on the entire complement of master regulator proteins responsible for launching and maintaining a specific tumor to predict the drugs that, by interfering with these proteins, will most likely benefit the patient. "Our tests find between five and 20 pharmacologically actionable targets per sample," says Dr. Califano, noting that the tests include all FDA-approved compounds, not just those developed to treat cancer. "Oncologists can decide how to proceed based on toxicity, literature knowledge, and their experience using those drugs." Startups like DarwinHealth have become an increasingly common vehicle for speeding innovative treatment approaches conceived within VP&S laboratories into clinical use, says Orin Herskowitz, Columbia University's senior vice president of intellectual property and tech transfer and executive director of Columbia Technology Ventures. This year, more than 400 inventions emerged from the University's research laboratories, generating more than 200 patent applications. Among the 100-plus licenses issued this year to commercial partners, more than two dozen were written to startups founded by Columbia faculty and students. Among them, the contingent representing VP&S stands out. "Increasingly, the most transformative therapeutics, diagnostics, and devices with the highest potential to save and improve patients' lives are being launched via startups emerging from university research labs," says Mr. Herskowitz. "VP&S researchers are incredibly innovative and driven to see their inventions make an impact on the world, so not surprisingly many are turning to entrepreneurship and working with venture capital investors to make sure this happens as quickly and effectively as possible." Consider, for example, the story of Ceracuity, co-founded in 2015 by Karen Duff, PhD, deputy director of the Taub Institute for Research on Alzheimer's Disease and the Aging Brain and a professor in the Department of Pathology & Cell Biology. Based in New York City, Ceracuity licensed a collection of small molecules developed by Dr. Duff and collaborator Wai Haung Yu, PhD, assistant professor of pathology & cell biology, to spur autophagy—the process by which the healthy brain quickly and effectively clears abnormal, toxic proteins—as a treatment for Alzheimer's, Parkinson's, and frontal temporal lobe degeneration linked to tauopathy. "Think of it like a garbage truck," says Dr. Duff, "taking out the recycling. We wanted to enhance the effectiveness of the garbage truck." President Jimmy Carter signed the Bayh-Dole Act in 1980, opening the door for investigators and their academic institutions to patent and license discoveries made in federally funded research enterprises. By the time Dr. Duff moved to the United States for her first academic post, in the early '90s, universities were beginning to take a more proactive approach to educating faculty about intellectual property rights and facilitating patent applications, but academics were expected to stay in their lane. "When I first started working on neurodegenerative diseases," says Dr. Duff, "there was a strict separation between people doing lab-based research and people doing therapeutic development." Over the past decade, however, cultural shifts within academia and within industry have converged to spur increasingly dynamic crossover among academics, drug companies, and biotech startups. Even so, says Dr. Duff, getting to the point where an academic can form her own company and see her intellectual property all the way from laboratory to FDA approval is still relatively rare. "This is a huge landscape change." Dr. Duff, who was actively involved in commercialization of transgenic mouse models before joining Columbia, credits the Ceracuity launch to a serendipitous introduction facilitated by Jeffrey Lieberman, MD, the Lawrence C. Kolb Professor and Chair of the Department of Psychiatry. A group of investors had decided to apply their business experience to end Alzheimer’s and approached Dr. Lieberman, who also directs the New York State Psychiatric Institute, for access to faculty whose research might be relevant. "There's a lot of frustration that pharma isn’t moving fast enough," says Dr. Duff, who attended the roundtable discussion Dr. Lieberman organized and presented an overview of her lab’s work. “There’s an opening and the need for the right drug, the right business model to get medicine in people's hands more quickly." After the event, Dr. Duff replied promptly to an email from the investors, asking about her vision for Alzheimer's therapeutics. "I was just looking for a donor," she says of the resulting correspondence. "It became clear they wanted a company format." Together, Dr. Duff and Dr. Yu decided to explore the prospect, with Columbia Technology Ventures staff facilitating negotiations with the investors. "We patented the small molecules, Ceracuity licensed them, and the partnership has gone on from there," says Dr. Duff, whose bona fides now include the titles co-founder, scientific advisory board chair, and member of the board of directors for Ceracuity, which completed its second round of seed funding in June. Applied Therapeutics Inc., which initiated its first phase 1 clinical trial in February 2018, is slightly farther along the commercialization track for a diabetes treatment based on research by a group led by Donald Landry, MD, PhD, the Samuel Bard Professor and Chair of the Department of Medicine. Also a founder and board member of Tonix Pharmaceuticals, Dr. Landry holds more than 34 patents on an array of small compounds and has a long-standing relationship with the CTV team. When biotech consultant Shoshana Shendelman, a Columbia PhD graduate, approached Columbia looking for licensing opportunities for her clients, the CTV team included Dr. Landry’s patent for a compound to block the aldose reductase enzyme, which has been implicated in a laundry list of disease processes, including diabetic retinopathy and cardiomyopathy. "I found the technology to be a really compelling opportunity for a biotech," says Dr. Shendelman, who decided to license the technology herself and launched Applied Therapeutics Inc. to bring Dr. Landry's work to the clinic. Dr. Landry traces his induction into the world of commercialization to his work with catalytic antibodies when he developed the first artificial enzymes to degrade cocaine as a treatment for overdose and addiction. In his first 10 years at VP&S, Dr. Landry hired chemists to produce small molecules necessary for the cocaine research and other projects and then had to retrain those individuals to handle more biological applications in order to keep them on his lab staff. To maintain chemists as chemists, Dr. Landry approached Merck, offering the company first option for licensing small molecules developed by his group in exchange for $1 million, and with this deal the Organic Chemistry Collaborative Center (OCCC) was founded. The center spurred a substantial increase in small molecule development for investigators across the university, as CTV presented each new protein or pathway discovered by Columbia investigators to OCCC to assess its potential for drug development. This innovative program led to the intellectual property at the heart of Applied Therapeutics, a triumph for the lead chemist on the project, Andrew Wasmuth, and Dr. Landry's other colleagues at the OCCC. "Currently there is no cure for diabetes, and patients suffering from the complications of diabetes normally have a much lower quality of life," says Dr. Landry. "Developing any treatment that can interrupt the pathophysiology of complications like diabetic cardiomyopathy and retinopathy would drastically change the natural history of the illness both in terms of survival and quality of life." To make sure all Columbia faculty and students have the tools they need to transform their discoveries into real-world products, CTV runs or helps to run a network of five lab-to-market accelerators, each tailored to a particular industry. Three are dedicated to biomedical innovation, including the Translational Therapeutics Resource (TRx). A collaboration among the Irving Institute for Clinical and Translational Research, Columbia Technology Ventures, the medical center's Clinical Trials Office, and, most recently, the Herbert Irving Comprehensive Cancer Center, TRx was established by the Irving Institute’s director, Muredach Reilly, MBBCh, to leverage Columbia's proficiency in target discovery and advance novel therapeutics from the lab along the path of commercialization. Dr. Reilly began envisioning TRx even before he was recruited to Columbia in 2016. "There's incredible basic science and clinical expertise and discovery at Columbia and many individual examples of faculty in basic and clinical research moving toward commercialization, licensing, and therapeutic programs," he says, "but there was no systematic program for bringing together all of the services and activities to guide investigators from discovery of a protein, gene, or target to commercialization." Often referred to as the "valley of death," the period that stretches from discovery to commercialization can be especially daunting in the case of drug development, spanning several years and often at great cost. "We were really focused on putting together an integrated program that would help investigators move successfully through that process," says Dr. Reilly. "We coalesced a set of core labs for screening, organic chemistry, small molecule development, experimental validation in animal laboratories—everything an investigator needs to go from the more scientific realm to the science of commercialization." The VP&S commitment to supporting and facilitating commercialization was central to his own enthusiasm about joining the faculty in July 2017, says TRx co-director Akiva Mintz, MD, PhD, professor of radiology and radiology's vice chair for translational imaging, who came to Columbia with multiple patents and experience in early-stage drug development. "One of the challenges I faced at prior institutions and companies was between the exciting discovery and translation into clinic in the valley of death," he says. "You can have a very good idea and it goes nowhere, because people with expertise in discovery aren't necessarily the ones with knowledge in the procedural steps required by the FDA. The environment at Columbia is special because the deep level of expertise and leadership in so many different areas enables the University to attract the best partners who work with investigators to transform ideas into treatments." Investigators typically get their feet wet with the TRx boot camp, an eight-week series offered every winter with guest lectures covering such topics as identifying target customers, working with the FDA, and pitching prospective investors. Boot camp alumni are eligible to apply for TRx pilot awards, which combine a grant of up to $75,000 with a tailored mentorship team whose participants are chosen for their experience in business, venture investment, the FDA application process, or some other facet of commercialization. Winners in 2017 included teams developing compounds to suppress appetite, treat cancer, and halt the progression of a specific type of schizophrenia. "It's not just, 'Here's a phone number,'" says Dr. Mintz, "but being with them on the journey, making sure things get done and they have the right partners." Gordana Vunjak-Novakovic, PhD, University Professor, the Mikati Foundation Professor of Biomedical Engineering, and director of the Laboratory for Stem Cells and Tissue Engineering, has launched four companies in the past five years, all based on research discoveries in her lab, which is located on the CUIMC campus. "There's super-qualified help from CTV," she says. "They support the filing and protecting of intellectual property and they helped on multiple occasions to get free advice from people who are skilled at filing FDA applications." For scientific investigators, she says, the world of patent applications might as well be conducted in a foreign language, making the CTV legal team a particularly valuable resource. "You know what your innovation is, but what comes back from the lawyers is this completely incomprehensible document," says Dr. Vunjak-Novakovic. "I'm absolutely sure that working in isolation we would never have these successes." To cultivate awareness of the commercialization process, Dr. Vunjak-Novakovic invites postdoctoral fellows, graduate students, and her research associates to participate in the TRx boot camps and the Columbia Biomedical Accelerator. In 2017, she and Lynne Johnson, MD, professor of medicine, received a TRx pilot award for an impregnated bandage to promote healing of bedsores and diabetic ulcers. "The TRx grant is funding critical experiments that prove the technology was viable," she says. Dr. Vunjak-Novakovic sees her team's myriad patents and commercial ventures as an extension of a culture of innovation and problem solving within the VP&S community, as well as her own open-door policy welcoming clinicians on a quest for solutions. One of the largest projects underway in her lab aims to bioengineer functional lungs to make up for the shortage of organs available for transplant. "That started with a visit from a cardiothoracic surgeon who brought us a problem he was struggling with six years ago," she says, "and now we're en route to clinical trials." On other occasions, a collegial clinician has spared the team from wasting time on a misguided approach. "You need the end user of your prospective technology to prevent you from doing something that is irrelevant," says Dr. Vunjak-Novakovic. "They also help direct our research in a way that is most applicable, allowing a seamless application in the clinic." Biophysicist David Brenner, PhD, director of Columbia's Center for Radiological Research, embarked on his research to find a better way to kill drug-resistant bacteria after a friend in his hometown of Liverpool, England, died from a surgical site infection after a routine hip replacement in 2012. Such deaths have been on the rise since the introduction of antibiotics in the 1940s, as the emergence of drug-resistant bacteria outpaces new antibiotic development. Deaths related to drug-resistant bacteria are even threatening to outpace deaths from cancer over the next few decades. Dr. Brenner said: Scientists have long known that ultraviolet (UV) light—which spans 200 to 400 nanometer wavelengths—efficiently kills all bacteria, drug-resistant and drug-sensitive. That's why hospitals use ultraviolet lamps to sterilize operating theaters. But because UV light also damages human cells—causing skin cancer and cataracts—these UV lights can only be used to sterilize inanimate objects when no people are present. "Even if you clean the room completely," says Dr. Brenner, "as soon as people come in they bring the bugs in with them, no matter how much they scrub." Using basic physics ideas and generously supported by a startup gift from Lynn Shostack, a member of the CUIMC Board of Advisors, Dr. Brenner and his colleagues started testing whether a type of ultraviolet light known as far-UVC—with wavelengths in the 200-220 nanometer range—might safely kill bacteria and viruses. They picked these wavelengths because they are absorbed very quickly by any biological material, so they can't penetrate even the dead cell layer of the skin and can't reach or damage the key cells in the skin or the eye. But bacteria and viruses in the air are far smaller, so far-UVC light can penetrate and kill these microbes. "The two big advantages of far-UVC light are that it doesn’t harm people and it doesn't care about drug resistance, because it kills bacteria and viruses in a different way from drugs," says Dr. Brenner. Knowing that any resulting device would require FDA approval, Dr. Brenner checked in with the Columbia Technology Ventures team early on and received funding from a private foundation and through the Columbia-Coulter Translational Research Partnership, where would-be entrepreneurs pitch their ideas for development capital. "In principle far-UVC light is both effective and safe," says Dr. Brenner, "but we needed to demonstrate this in as many ways as we could." In a series of papers in the journals PLOS One and Radiation Research, he and his colleagues detailed their findings suggesting that far-UVC light effectively kills drug-resistant bacteria during surgical procedures without harming the patient. More recently, in a paper published in the journal Scientific Reports, the team expanded its vision, showing that far-UVC lamps efficiently kill airborne microbes, such as influenza. That may make it possible for public spaces—airports, airplanes, medical offices, schools, even food prep facilities—to be equipped with overhead far-UVC lamps. "We want to safely kill airborne microbes like influenza, TB, and measles, whilst of course not harming the good bacteria that make up the human microbiome," says Dr. Brenner. While all faculty receive a percentage of licensing fees generated by their intellectual property and many serve on the scientific advisory boards of their respective startups, Columbia has strict policies in place to prevent conflicts of interest that might arise for faculty researchers, including a prohibition on executive posts in startups for faculty. Dr. Brenner focuses on the far-UVC science and technology development and is happy to put the entrepreneurial side of the story in the hands of the Columbia Technology Ventures team; through the team's efforts, Dr. Brenner and colleagues were awarded their first U.S. patent for the technology. From her perspective, Dr. Vunjak-Novakovic says policies that preserve a chasm between scientific innovators and entrepreneurial development promote both job creation and the long-term success of the resulting companies. Her former postdoctoral fellows Nina Tandon, PhD, and Sarindr Bhumiritana, PhD, now serve as chief executive officer and chief scientific officer, respectively, of Brooklyn-based Epibone, which the trio co-founded with Sidney Eisig, DDS, the George Guttmann Professor of Clinical Craniofacial Surgery and director of oral and maxillofacial surgery in the College of Dental Medicine. "The best way to ruin your company is to run it yourself," she says. "It's like not letting your child leave home. You have to find capable people to work there and let them do their jobs." This article was published in the 2018 VP&S Annual Report. The full issue is available as a PDF here. Researchers have developed a spinal fluid test that can accurately identify most patients with Alzheimer's disease, according to a clinical study. By tapping amyloid and tau levels in cerebrospinal fluid, Columbia University neurologists may have found a reliable way to help diagnose the disease. The findings were published this week in the Journal of Alzheimer's Disease. Currently, no single test can definitively identify Alzheimer's, a neurological disease where dementia symptoms gradually worsen over a number of years. "Our study shows that this is a good test that can be used in clinical practice to reliably exclude other diagnoses in patients suspected of having Alzheimer's disease," Dr. Richard Mayeux, chairman of the Department of Neurology at Columbia University Vagelos College of Physicians and Surgeons, said in a press release. "It's better than amyloid PET scans, which only look at the amount of amyloid protein in the brain, because it measures amyloid and two types of tau protein." Cerebrospinal fluid can determine the brain's condition because of its direct contact with the brain. Certain levels of tau and amyloid proteins in this fluid have been found to be associated with the disease. While neurologists have included tests for the two biomarkers when doing diagnostic workups of cerebrospinal fluid, a previous analysisof 231 studies suggested the test has limited benefits in clinical practice. "But these studies only compared individuals who had been clinically diagnosed with Alzheimer's with healthy controls," Mayeux said. "That doesn't reflect what's done in clinical practice, where physicians must determine whether dementia and other symptoms are due to Alzheimer's or other diseases." For the new study, researchers examined data from 1,016 patients at Columbia University Irving Medical Center with various forms of dementia or mild cognitive impairment. The patients had undergone lumbar puncture between 2005 and 2017, and the cerebrospinal fluid samples were sent to a commercial laboratory for analysis. The test identified roughly 90 percent of those with a clinical diagnosis of Alzheimer's disease, compared with patients with no dementia or other types of dementia. Also, the test correctly identified about 70 percent to 80 percent of patients with other types of dementia or mild cognitive impairment, but didn't distinguish among the different types. "Our study shows that this is a good test, just missing the accuracy in distinguishing between Alzheimer's and non-Alzheimer's dementia or mild cognitive impairment needed to make it an excellent test," Mayeux said. In the 30- to 40-minute procedure, a lumbar puncture is performed with a local anesthetic to collect the fluid. The authors noted fewer than 5 percent of patients experienced a headache after this procedure. The test costs around $1,000 -- compared with $3,500 for an amyloid PET scan -- and "is much easier to administer and is much safer than many people think," Mayeux said. In many ways, Matt Fender, a 32-year-old resident of New York City, is the prototypical 23andMe customer: tech-savvy, educated, a bit of a worrier. But he wasn’t worried last December when he clicked a button to dump all the raw data from his 23andMe genetic test into a DNA search engine called Promethease, which sorts through data for gene variants that have received a mention in the medical literature. Mr. Fender didn’t expect any revelations. He had already spent $5 on a Promethease report in 2016, which he’d found interesting but not life changing. But the company had recently emailed customers asking them to re-enter their data to be used for future research and quality control. In return, they were offered a free update. Mr. Fender’s update included something new: the terms "PSEN1" and "pathogenic." Mr. Fender is a coder, not a geneticist, but he had spent enough time scrolling through his 23andMe results to know he had gotten some bad news. The PSEN1 mutation is associated with an early-onset form of Alzheimer’s, and it is often described as "100 percent penetrant," which he quickly came to understand meant no exceptions — everyone with the variant gets the disease. Most show signs by their mid-40s. Mr. Fender, who describes himself as "the kind of guy who gets excited about responsible financial planning," saw all his carefully crafted plans for the future slip away. The year 2017 was a breakout period for consumer genetic testing. Ancestry.com tested four million people. 23andMe rebounded from being temporarily shut down by the Food and Drug Administration to score a place on Amazon’s list of the five top-selling items on Black Friday weekend. One estimate in MIT Technology Review put the number of American adults who now have access to some form of personal genomic data at one in 25. Genetic health tests are often criticized for providing weak or marginal information about a person’s risk for common conditions like heart disease or diabetes. But while many customers get less than they bargained for, some, like Mr. Fender, get quite a bit more. These reports come plastered with lawyerly admonitions to "consult your doctor." But it’s not as easy as that suggests. Most doctors are distrustful of direct-to-consumer testing. They aren’t trained – or paid – to go through complicated genetic reports with patients. And they’re leery because the information rarely leads to improved treatments. When Mr. Fender first approached a doctor about his genetic test results, it was 2013, and it was "like he was annoyed at me," Mr. Fender says. Mr. Fender had purchased the original 23andMe test in part because he had a sister who died of a pulmonary embolism at 23 and he worried about his own risks. The test didn’t tell him anything about his chance of having an embolism, but it did say that he carried two copies of a gene variant called ApoE4, which greatly increases one’s chance of getting late-onset Alzheimer’s disease by age 85. This information was disturbing but manageable. His doctor wasn’t much help, but that limited advice, combined with a lot of online research, led Mr. Fender to look for ways to improve his health through diet, exercise and supplements. This time, Mr. Fender was prepared for skepticism. His email to his primary care physician was borderline apologetic. "I know this is an area of medicine that is maybe half-baked and possibly annoying to you," he began, before reviewing what he had learned and requesting advice. "It’s not about the issue being half-baked," the doctor replied, "but what the heck do we do about it, once we know, other than create high anxiety?" The doctor referred Mr. Fender to a geneticist, but it turned out he did not see patients under 50 who were not symptomatic and had no family history of the disease. Mr. Fender then tracked down Jill Goldman, a genetic counselor specializing in dementia at the Taub Institute at Columbia University Medical Center, who described a multistep process of counseling and confirmatory testing that’s been the standard of care for 25 years. She typically serves people at high risk of inheriting a disease, and insurance usually covers both the consultations and the tests. But it was unlikely to cover the costs in the absence of family history. "It was like a chicken-and-egg thing," Mr. Fender observes. "I needed a medical test to prove to them that it was real, but I couldn’t get a medical test until I could prove to them that it was real." Meanwhile, he happened to see a holiday special — $69 — for Ancestry’s genetic risk test. He realized he could use it to, in effect, get a second opinion about his PSEN1 variant. Five weeks later, the results were ready. He downloaded his raw data and returned to Promethease. An hour later, he had a new report. He looked for PSEN1 at the top of the list. It wasn’t there. Dumbfounded, Mr. Fender searched for the variant he was looking for: rs63749911. This time, his genotype was listed as common/normal. It was good news, and yet, the two tests were at odds. He had heard that both 23andMe and Ancestry were 99.9 percent accurate. Which one should he believe? In other words, the number of mistakes can be as high as 600 per customer. Greg Lennon, a co-founder of Promethease, says the company occasionally catches mistakes and warns customers. Mr. Fender found himself left to grapple with the discordant results on his own. He felt more than ever in need of a doctor’s advice. The direct-to-consumer genetic testing marketplace is a regulatory Wild West. The F.D.A. stopped a proposed deal between Pathway Genomics and Walgreens in 2010 that would have put the tests in drugstores nationwide. It cracked down on 23andMe in 2013, after the company’s first major advertising campaign. But these regulatory efforts look like a game of whack-a-mole. Now the bar is getting lower. A new regulatory structure announced in November by the F.D.A.’s commissioner, Scott Gottlieb, will allow 23andMe and other vetted providers to introduce some tests for health risks without premarket review. This change is expected to usher in a rapid expansion of the consumer genetics industry. And however limited the rules are for direct-to-consumer genetic testing, they are downright draconian in comparison with the free-for-all world of third-party interpretive services like Promethease, which bills itself as a "literature retrieval system," with no responsibility for the testing or results themselves. At first Mr. Fender tried to just believe that the Ancestry results were true and that the 23andMe finding was a mistake. It seemed more probable; the PSEN1 variant linked to early-onset Alzheimer’s, he learned, is usually inherited, and Mr. Fender’s parents are in their 60s and healthy. If he was wrong, he wasn’t sure he wanted to know. But he found the lingering doubts disquieting, and eventually persuaded his doctor to order a clinical test of the PSEN1 gene. It was negative. Mr. Fender, relentlessly upbeat, expresses gratitude for the experience. "It was very motivating," he says, citing how he has improved his diet and learned to cook. It gave him empathy for people suffering from dementia, and he is thinking about developing an app using voice-activated personal assistants like Siri and Alexa. "People with Alzheimer’s lose track of what they are doing and may empty every drawer in the kitchen because they don’t remember that they are looking for their keys. Alexa could ask them what they’re planning to do and then give them reminders." He pauses, and it is suddenly easy to imagine what it has been like, spending every day for months picturing a future with dementia. "Like, how’s it going looking for your keys, Matt?" he adds. His story, as bad as it was, could have been much worse. He had both the temperament and the skill to gather crucial information in a relatively short time. A person with fewer resources or different inclinations might have lived for years under that cloud, waiting to get sick. Breaking down what you need to know about the brain conditions. Seeing someone you love like a parent or grandparent experience memory loss can be crushing. However, just because someone starts having slip-ups doesn’t automatically mean they’re showing signs of Alzheimer’s disease. It could, of course, be nothing. Or cognitive confusion or decline could be more of a sign of dementia – which isn’t the same thing as Alzheimer’s, despite what many people might think.Although there’s an overlap between the two, there are some important differences to note. Below is information on how dementia and Alzheimer’s vary, so you can help your loved ones – or yourself – get the right kind of treatment. Dementia can sum up many different brain-related conditions and should be thought of more as a syndrome rather than a disease. "Dementia is a cognitive loss at any time of life and encompasses many diseases," said George Perry, chief scientist of the Brain Health Consortium at the University of Texas at San Antonio and editor-in-chief of the Journal of Alzheimer’s Disease. "It can happen at any stage of life … or because of an accident resulting in brain damage or a stroke." Within this group is Alzheimer’s disease, which accounts for more than 50 percent of dementia diagnoses, according to Elise Caccappolo, associate professor of neuropsychology and director of the Neuropsychology Service at Columbia University Medical Center. And while the causes of Alzheimer’s are a little tricky to pinpoint (more on that below), age can be a big factor. "Over 60 percent of age-related cognitive loss in the U.S. is due to Alzheimer’s," Perry said. Most people won’t know for sure if they have Alzheimer’s. What makes Alzheimer’s a difficult disease to pinpoint is the fact that the condition is only confirmed through an autopsy. "We can diagnose it when someone is alive, but we are never completely certain until after they go to an autopsy, and we look for specific pathological changes in the brain that we can determine that they died from Alzheimer’s," Caccappolo said. "Major medical centers are pretty good at diagnosing it, but in other parts of the country or [when seeing] a general neurologist, the term ‘Alzheimer’s’ can be thrown around very commonly, and if someone doesn’t have it, the medication isn’t going to help, and they could be missing out on other treatments," she added. One of the biggest red flags that someone may have Alzheimer’s is the classic short-term memory loss. This is because Alzheimer’s manifests itself in the area of the brain responsible for learning new information and making new memories, Caccappolo said. This explains why someone with Alzheimer’s can likely remember what they ordered on their first date with their spouse 50 years ago, but has trouble remembering where they put their glasses (or that they even now need glasses). Next to Alzheimer’s, there are three types of dementia that Caccappolo and Perry say are the most common. These include vascular dementia, which is when someone experiences a stroke or diabetes that results in a lack of oxygen to the brain; frontotemporal dementia, a condition that typically affects people ages 60 and up, where a protein that’s similar to Alzheimer’s leads to nerve cell loss in the brain; and Lewy body dementia, where protein deposits develop in the areas of the brain responsible for motor skills and memories. All of these diseases have different symptoms, but overall there may be instances of severe mood swings, personality changes and a major decline in cognitive and motor skills. Anything from absorbing information to getting dressed in the morning takes longer and is more tedious to handle. Perry added that in severe cases, such as with Lewy body dementia, patients may even experience hallucinations. A bit of an unsettling aspect to dementia and Alzheimer’s both is that there’s no real cursor as to who is more susceptible than others to develop a dementia-related disease. "Most of these diseases are sporadic, they have no obvious genetic cause," Perry said. Some people may have genetic inheritance ― and typically those cases are the early onset version of the disease ― but just because someone in your family had Alzheimer’s doesn’t mean you’re going to have it too. "If your grandmother had it in her 40s then you might be more concerned and do genetic testing, but if she had it over the age of 65 you may have an increased risk, but it’s really small," he said. Perry does stress that Alzheimer’s is more prevalent in women, most likely because women tend to live longer than men. "Alzheimer’s prevalence doubles every five years after the age 60," he said. It’s been debated if alcohol consumption can cause any form of dementia, including Alzheimer’s, but Caccappolo said there’s no reason to believe this is fully true. "We don’t diagnose dementia from alcohol frequently, and it’s not a known cause. It makes other things worse, but it’s rare people get dementia just from alcohol abuse," she said. Results from a clinical trial conducted by Columbia University Irving Medical Center and Duke University Health System suggest that donepezil—an Alzheimer’s drug—may not improve cognitive performance in people at risk for Alzheimer’s disease who also had depression. "Both late-life depression and mild memory loss are established risk factors for dementia, and when they co-occur, the risk for future dementia is even higher. That is why it is critical to find effective therapies for this population," said study author Devangere Devanand, MD, professor of psychiatry and neurology and director of geriatric psychiatry at Columbia University Vagelos College of Physicians and Surgeons. Co-author Murali Doraiswamy, MD, professor of psychiatry and medicine at Duke University Health System added, "There are no FDA-approved therapies for preventing dementia in at-risk people with both mild cognitive impairment and depression. Cholinesterase inhibitors used to treat Alzheiemer’s, such as donepezil, and a variety of supplements are often used in clinical practice to treat such patients, but their efficacy in this population isn’t proven." The study is titled, "Donepezil Treatment in Patients With Depression and Cognitive Impairment on Stable Antidepressant Treatment: A Randomized Controlled Trial." "Amyloid is most certainly implicated in Alzheimer’s, but the disease is far more complex than we’ve appreciated," says Philip L. De Jager, MD, PhD, a neurologist at Columbia University’s Vagelos College of Physicians and Surgeons. "It’s clear that we need to find completely new strategies to prevent or at least slow the progression of the disease, but we’re just now developing the tools to understand the disease’s complexity." "Big data" approaches like network analysis have been used to unravel the complex molecular pathways that govern cancer, but their use in Alzheimer’s research has lagged behind. "One advantage with cancer is that tissue samples are usually accessible," De Jager says. "In neurological diseases, we haven’t had enough brain tissue from people who were tracked carefully as they developed dementia to do these sorts of analyses." De Jager’s recent worksuggests that Alzheimer’s is now ready for big data studies. With this network diagram in hand, they then looked for the small number of genes in the network that appear to drive the changes seen in the study’s participants. Such "driver genes" are potentially excellent targets for new Alzheimer drugs, because as the network’s nodal points, turning them on or off may have the greatest therapeutic effect. One can think of them as the switches in a complicated circuit that open or close a whole series of downstream events. "Capturing all of these data allowed us to look for patterns related to the disease without making any assumptions about what was important," De Jager says. The researchers recently reported results from this analysis in Nature Neuroscience.They describe 11 groups of genes or modules that appear to directly affect cognitive decline, amyloid, and other Alzheimer’s-related traits. Is 'Friendly Fire' in the Brain Provoking Alzheimer’s Disease? In early 2017, Sarah's grandfather passed away from complications of vascular dementia. Her family never truly dealt with his diagnosis, and the end of his life felt totally disconnected from how he lived. So Sarah set out in search of a better way to live with dementia. The Lewy Body Dementia Association (LBDA) has announced the launch of the LBDA Research Centers of Excellence (RCOE), a comprehensive network of 24 academic medical centers—including Columbia—that will work together with a common goal to improve the understanding of the disease in the scientific, medical and general public communities. The LBDA RCOE program aims to establish a clinical trials-ready network of leading institutions that share the common vision of providing the highest level of clinical care over the course of LBD treatment. In addition, the RCOE network seeks to increase access to support for caregivers and people living with LBD, increase the knowledge of LBD among the medical community, and construct administrative infrastructure and generate the resources necessary to further advance LBD research and care. The centers were chosen for their clinical expertise in LBD, experience running clinical trials in related conditions (combined, the 33 PIs have run 380 clinical trials in the past 5 years), their facility's capacity and willingness to participate, and their geographic locations. The 24 RCOEs are spread across 17 states and the District of Columbia and are located in 23 American metropolitan areas. Each RCOE is led by recognized primary investigators (PIs) and co-investigators to conduct trials and provide expert care. Columbia Neurology faculty members Drs. Lawrence Honig and Karen Marder will serve as the co-directors/co-principal investigators of Columbia’s LBDA RCOE site. More information on the LBDA RCOE program can be found on LBDA's website at https://www.lbda.org/rcoe. A paper published today in the New England Journal of Medicine reports that solanezumab, a monoclonal antibody-based treatment for Alzheimer's disease developed by Eli Lilly that targets amyloid plaques, did not significantly slow cognitive decline. Researchers have proposed that Alzheimer's disease is caused by the buildup of a sticky protein called beta-amyloid. According to this "amyloid hypothesis," the protein forms plaques in the brain that damage and eventually destroy brain cells. Solanezumab was designed to reduce the level of soluble amyloid molecules before they aggregate. A total of 2,129 patients with mild dementia due to Alzheimer’s disease participated in the double-blind, placebo-controlled, phase 3 multicenter trial. This study was the first major Alzheimer’s clinical trial to require molecular evidence of amyloid deposition in the brain for enrollment. While the treatment did have some favorable effects, in the main measure of outcome—measured with a cognitive test called the Alzheimer’s Disease Assessment Scale-cognitive subscale—the researchers did not observe any statistically significant benefit compared with placebo. In other studies ongoing at Columbia University Irving Medical Center and other centers, solanezumab is being evaluated in presymptomatic patients at risk of Alzheimer’s disease. Other Alzheimer's drugs are also in development and being tested at higher doses. New York, NY (November 10, 2017) – Researchers at Columbia University Medical Center (CUMC) and the New York State Psychiatric Institute (NYSPI) may have discovered a way to use a patient's sense of smell to treat Alzheimer's disease before it ever develops. Having an impaired sense of smell is recognized as one of the early signs of cognitive decline, before the clinical onset of Alzheimer's disease. The researchers at CUMC and NYSPI have found a way to use that effect to determine if patients with mild cognitive impairment may respond to cholinesterase inhibitor drugs to treat Alzheimer's disease. Drugs Can't Stop Alzheimer's. A New Model of the Disease Explains Why. The Department of Neurology is very pleased to announce that Philip De Jager, PhD, MD, MMSc has joined our faculty as Professor of Neurology (in the Taub Institute for Research on Alzheimer's disease and the Aging Brain and the Columbia Precision Medicine Initiative). After graduating from Yale University with a degree in Molecular Biophysics & Biochemistry (as well as Medieval French literature), Dr. De Jager received a PhD in Neurogenetics from Rockefeller University and an MD from Cornell University Medical College before completing his MMSc in Clinical Investigation at Harvard Medical School (HMS) and MIT. He served as a neurology resident in the Partners Neurology Residency Program at the Massachusetts General Hospital and Brigham and Women’s Hospital. He then joined the faculty at HMS, rising to the rank of associate professor before joining CUMC. The goal of Dr. De Jager's work as a clinician-scientist is to apply modern methods of neuro-immunology, statistical genetics, and systems biology to the understanding of common neurodegenerative diseases. In Neurology, Dr. De Jager will serve as chief of a new Division of Neuro-immunology, which will include a new Center for Translational & Systems Neuro-immunology that he will direct, as well as the Multiple Sclerosis Clinical Care and Research Center, directed by Dr. Claire Riley. The focus of this new division will be to characterize and target the neuro-immunologic component of neurodegenerative disease. Please join us in welcoming Dr. De Jager to Neurology and CUMC! Also covered by Bioscience Technology, International Business Times, and Daily Mail. Columbia University Medical Center (CUMC) researchers have discovered that the spatial disorientation that leads to wandering in many Alzheimer's disease patients is caused by the accumulation of tau protein in navigational nerve cells in the brain. The findings, in mice, could lead to early diagnostic tests for Alzheimer's and highlight novel targets for treating this common and troubling symptom. Also covered by: Lab Chat (STAT), Genetic Engineering & Biotechnology News, Cosmos Magazine, Medical News, ScienceDaily, Medical News Today, Daily Mail, Mirror, PsyPost, Alzheimer's Reading Room, and Medical Xpress. Also covered by NPR: ""The whole idea is to create tests that a general clinician can use in an office setting," says Dr. William Kreisl, a neurologist at Columbia University." And by: CNN, Healio, Medscape, Immortal News, Science Daily, Medical Daily, Genetic Engineering & Biotechnology News, Nature World News, MedPage Today, PsychCentral.com, CTV News, and Business Standard. 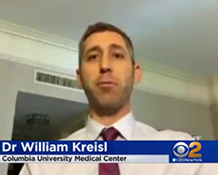 Earlier this month, CBS News aired a feature on a joint, ongoing study by the Taub Institute (Drs. Scott Small and Adam Brickman) and the Division of Behavioral Medicine (Drs. Richard Sloan and Paula McKinley) on how dietary cocoa flavanols — naturally occurring bioactives found in cocoa —reversed age-related memory decline in healthy older adults. Previous results from a first study, published in Nature Neuroscience, provided the first direct evidence that one component of age-related memory decline in humans is caused by changes in a specific region of the brain and that this form of memory decline can be improved by a dietary intervention. These investigators are currently recruiting for another, larger study on the effects of cocoa flavanols. My Mother had Alzheimer's. Will my Fate be the Same? "To understand my mother's disease and my own risk, I felt I needed to know what form of Alzheimer's she had, so I phoned Columbia University's Richard Mayeux. In 1985, Mayeux was the brilliant researcher who would find the cure for Alzheimer's disease if anyone could, according to my father. Mayeux was the reason my father drove my mother from our home in central New Jersey to Manhattan when her short-term memory failure grew so bad that she could no longer carry on a conversation. Also covered by: WASHINGTON POST, NEW YORK TIMES, TIME, NBC TODAY, ABC NEWS, CBS NEW YORK, SCIENTIFIC AMERICAN, IFL SCIENCE!, and THE GUARDIAN. Also covered by: NPR: All Things Considered, REUTERS,U.S. NEWS & WORLD REPORT, BLOOMBERG NEWS, NEW YORK DAILY NEWS, HEALTHDAY NEWS, HUFFINGTON POST, HEALTH CENTRAL, and UNIVERSITY HERALD. Also covered by: WBUR RADIO (NPR, Boston, MA), GENOME WEB, EVERYDAY HEALTH, RED ORBIT, PRENSA LATINA, MEDICAL NEWS TODAY, MEDILEXICON, MEDICAL XPRESS, BIOSCIENCE TECHNOLOGY, TELESUR TV, EUROPA PRESS, ABC.ES, and JAKARTA GLOBE. Arlene Lawton, RN has been selected to receive the 2012 P&S Award for Excellence in Research. As her many nomination letters attest, Arlene "has been an example of excellence in research for over 20 years." As a research nurse at the Alzheimer's Disease Research Center (ADRC), coordinator for our Brain Donation program, and senior staff associate in the Taub Institute, Arlene has made a "lasting impression on countless individuals," "broaching difficult topics with extraordinary grace," and treating patients and colleagues alike with "genuine warmth and kindness" in a "poised and professional" manner. Dr. Yaakov Stern was one of several notable panelists to participate in the Alzheimer's Association Annual Meeting presentation, "Crosswords, Computers, and Cognition: What's Going on in Your Brain? ", now available online. With nearly 400 people crowding the Times Center auditorium, this event was the most well-attended in the New York City chapter's history. 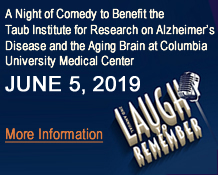 Dr. Manly's work on the "Early Detection of Alzheimer's among Diverse Populations" is the topic of Columbia University Medical Center's Research Capsule. Drs. Wai Haung Yu and Jessica Wu of the Taub Institute received awards from the American Health Assistance Foundation for "Tau Homeostasis Via Proteasomal & Autophagic Activity" and "Conformation-Dependent Uptake and Secretion of Tau," respectively. Frontotemporal Dementia (FTD) is a group of poorly-understood, frequently misdiagnosed brain diseases that can result in drastic personality changes in affected individuals. Columbia Neurology FTD expert Dr. Edward Huey and Genetic Counselor Jill Goldman were recently featured in an in-depth New York Times article titled, "When Illness Makes A Spouse A Stranger," which chronicles one couple's courageous battle with this devastating neurological disorder. A new study by Dr. Nikolaos Scarmeas has found that consumption of omega-3 fatty acids, plentiful in fish and nuts, is associated with lower blood levels of beta-amyloid protein… read more in The New York Times. Dr. Scott Small and colleagues from Neurology and the Taub Institute examined the association of depressive symptoms, antidepressant use and brain volumes on MRI, in a large cohort of nondemented, elderly individuals from the Washington/Hamilton Heights-Inwood Columbia Aging Project (WHICAP). Their results, currently published online in the Journal of Alzheimer's Disease, suggest that late life depression is associated with more global brain atrophy, more atrophy of the hippocampus, and more white matter lesions, mainly driven by antidepressant use. Drs. Roy Alcalay, Nikolaos Scarmeas, and others from Neurology and Taub Institute found Mediterranean-style diet adherence to be associated with reduced odds for Parkinson's disease (PD). Their study, currently published in an online version of Movement Disorders, also suggests an association between higher MeDI adherence and later PD age at onset. Dr. Scott Small on recent developments in Alzheimer's, featured on Charlie Rose. Dr. Adam Brickman on "Silent Strokes Tied to Memory Loss Among Older Adults," featured on Voice of America, USA Today. Drs. Karen Duff, Scott A. Small, and Li Liu on "Path Is Found for the Spread of Alzheimer's," featured in The New York Times. Dr. Jennifer J. Manly on "US wants effective Alzheimer's treatment by 2025," featured in the Associated Press. Dr. Adam Brickman, was selected to receive the Early Career Award from the International Neuropsychological Society. He will be delivering an award address titled "Reconsidering the Role of White Matter Disease in Cognitive Aging and Dementia" at the 40th annual meeting of the Society next month in Montreal. Bernadette Boden-Albala, DrPH, Department of Neurology, and Jose Luchsinger, MD, Taub Institute, have received $3.9 million over five years from the National Institute on Minority Health and Health Disparities for "Northern Manhattan Initiative for Minority Involvement in Clinical Trials (NIMICT)." Eric A. Schon, PhD, Lewis P. Rowland Professor of Neurology in Genetics and Development has received an award from the Alzheimer's Drug Discovery Foundation for his project, "Mitochondria-Associated Membranes in the Pathogenesis of Alzheimer's Disease: A New Target for Drug Discovery." Dr. Adam Brickman, has been selected to receive the 2011 Margaret M. Cahn Research Award, for his research on white matter hyperintensities in aging and Alzheimer's disease, from the Alzheimer's Association Hudson Valley/Rockland/Westchester, NY Chapter. Yaakov Stern, PhD, Professor of Clinical Neuropsychology in the Departments of Neurology, Psychiatry, and Psychology has been awarded a new RO1 and two 5-year renewals from the NIH for his projects: "Exploring Cognitive Aging Using Reference Ability Neural Networks"; "Predictors of Severity in Alzheimer's Disease"; and "Imaging of Cognition, Learning, and Memory in Aging." Edward D. Huey, MD, Assistant Professor of Psychiatry and Neurology and Jill Goldman, MS, MPhil, Genetic Counselor, both in the Taub Institute, are co-directing a CME program, "Is it Alzheimer's Disease or Frontotemporal Degeneration? An Update on Diagnosis, Management, and Research," on Monday, December 12, 12:15-4:45 PM, in the NI Auditorium. Scott Small, MD, Professor of Neurology in the Taub Institute and Sergievsky Center and colleagues have reviewed recent neuroimaging findings that indicate common brain disorders, from Alzheimer's disease and cognitive ageing to schizophrenia and depression, differentially target distinct functional and molecular subregions of the hippocampus, suggesting a unified pathophysiological framework of hippocampal dysfunction. Karen Marder, MD, MPH, Sally Kerlin Professor of Neurology and Psychiatry was appointed as one of three site investigators to serve on the Executive Committee of the NINDS NeuroNEXT project. The NeuroNEXT network of 25 sites nationwide, including Columbia in partnership with Weill-Cornell, will provide a standardized, accessible infrastructure to facilitate rapid development and implementation of protocols in adult and pediatric neurological disorders.